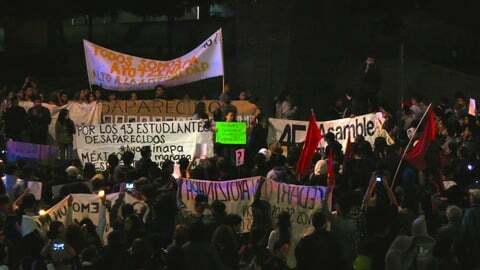 Angry protests swept Mexico over the weekend in the wake of a press conference Friday in which Jesús Murillo Karam, the country’s attorney general, declared that 43 missing teaching students from the Ayotzinapa Normal School in the state of Guerrero are all dead. Murrillo based this evaluation on confessions by gang members that they had killed the students, who were handed over to them by the police, and then burned their bodies. Demonstrations in both Mexico City and the Guerrero capital of Chilpancingo saw clashes with police and attacks on government buildings. In the capital, a small group of demonstrators launched an attack on the historic National Palace in the city’s main square (El Zócalo). They first used metal security barriers to ram the building’s wooden door and then doused it with gasoline and set it on fire. Some demonstrators questioned why it took police so long to respond to these acts, suggesting that they could have been the work of provocateurs. 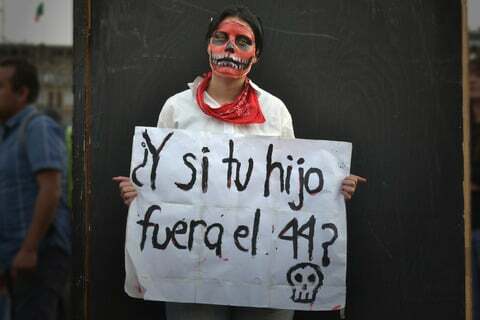 Image: What if your son was the 44th? Whatever the case, Mexico’s president, Enrique Peña Nieto, sought to exploit them, using an impromptu press conference at the Anchorage, Alaska, airport to declare that he joined all Mexicans in saying “no to violence,” thus attempting to equate the abominable crimes carried out against the Guerrero normalistas, as the teaching students are known, with isolated acts of property damage by protesters. On Monday, protesters, led by teachers, students and relatives of the disappeared normalistas, as the student teachers are known, overwhelmed riot police and set up a blockade of the international airport in Acapulco, the Pacific coast resort that is Guerrero’s largest city. Last Wednesday, university students struck across Mexico, and a hundred thousand people marched in downtown Mexico City in protest over the killings. This followed weeks of marches and protests throughout the country, and internationally. In his press conference on Friday, Mexican attorney general Murillo Karam presented taped confessions of three recently detained members of the Guerreros Unidos (United Warriors) gang who said they killed and then burned the bodies of the missing students, who have been missing since September 26. According to Murillo, Iguala’s mayor, José Luis Abarca, ordered the police to detain the protesting students because he did not want them to disrupt his wife’s speech to a municipal function. Abarca and his wife were only captured last week hiding out in a working class district in Mexico City. The confessing gang members said that local police from the city of Iguala and the nearby town of Cocula handed over numerous students to them, who were then bundled into two trucks. Some died from suffocation in the trucks, and then the others were killed at the top of a nearby landfill. The bodies were then tossed down to the bottom of the dump, where the gang members said they burned them for 14 hours in a fire kindled with wood, tires and plastic. Finally, the gang members claimed they crushed the remains into small pieces and poured them in plastic bags that they threw onto the banks of the San Juan River. Murillo said that investigators recovered some of the bags of remains, and that their contents would be subjected to DNA testing of mitchondria by scientists from the University of Innsbruck, Austria. 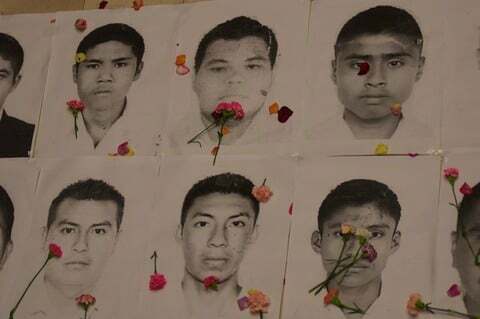 However, said Murillo, the remains had been so pulverized that it will be difficult to state definitively whether they were of the missing students. Murillo also presented gruesome videos of charcoal-like pieces he said were found in the plastic bags. A hundred thousand people marched in downtown Mexico City in protest over the killings on Wednesday, following on weeks of marches and protests throughout the country, and internationally. The Mexican government has so little credibility that Murillo’s press conference only threw more fuel on the fires of the outrage that has enveloped Mexico and the world over the student disappearances. Three other gang members had already confessed in early October to killing 17 of the students and tossing them in a mass grave near Iguala. Bodies recovered there then turned out to not be the students. Why, Murillo was asked, should the government be believed this time? Parents of the teachers said they would have their own DNA analysts from Argentina test the remains. “It appears that the government, with great irresponsibility, is interested in closing this matter because it’s all based on testimony. There is nothing definitive,” said Meliton Ortega, an uncle of a missing student. In the wake of Murillo’s press conference, Amnesty International issued a statement indicting the attorney general for failing to recognize or address the fact that the students’ disappearance was a crime of the state, and not an isolated occurrence. 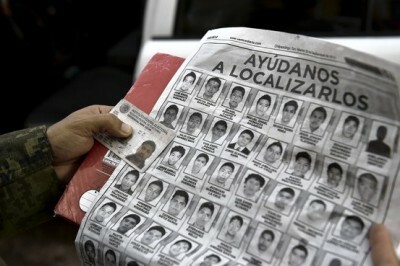 It charged that the investigations into both the student disappearances and the June 2014 extrajudicial executions of 22 people by Mexican army soldiers in Tlatlaya, Mexico State, had been limited and incomplete, and accompanied by a refusal to question the collusion between the state and organized crime, which underlies these grave violations of human rights. Guevara-Rosas pointed out the negligence and complicity of the federal government in failing to investigate a series of denunciations last year against Abarca for corruption and grave crimes. Guevara-Rosas specified that Abarca had been accused last year of personally participating in the killing of three local activists, which was detailed in testimony before a notary public, but that Murillo never investigated these matters. Guevara-Rosas also cited the failure to bring to justice federal and local police involved in the assassination of other Ayotzinapa students in December 2011, and the torture of 20 other persons. Guevara-Rosas concluded with the obvious—that had Murillo investigated Abarca last year when these accusations were made, the gruesome events surrounding the disappearance of the 43 normalistas may well not have occurred. Finally, Guevara-Rosas reproached Mexican president Enrique Peña Nieto for failing to permit experts from the Inter-American Commission on Human Rights to enter Mexico in order to investigate the disappearances of 43 students and the Tlatlaya massacre.